As a Chicago personal injury lawyer, I everyday seems to remind me that back and neck injuries are indeed serious injuries that can result in permanent disability, paralysis, or even death. Back and injuries can involve the bone, muscle, or soft tissue. Common injuries include strains and sprains, fractured vertebrae, sciatica, and herniated disks. The most common location for back injuries and back pain is the lower back because the lower back supports your body weight. 80% of people will experience low back pain at some point in their lives. Common causes of back and neck injuries include trauma (falls, motor vehicle accidents, sports, birth injury), arthritis, cancer, degenerative conditions, and surgical injury. There are two types of back pain: acute and chronic. Acute back pain lasts a short time, between a few days to a few weeks. It is usually caused by an injury to the muscles or ligaments in the back. Chronic back pain is caused by repetitive motion, poor posture, arthritis, herniated disk, or conditions affecting the spine. Risk factors for chronic back pain include: being over 30 years old, being overweight, pregnancy, lack of exercise, smoking, or heavy lifting. Neck pain usually involves similar symptoms and treatments as back pain. Symptoms include a burning, tingling, or aching sensation or sharp pain. 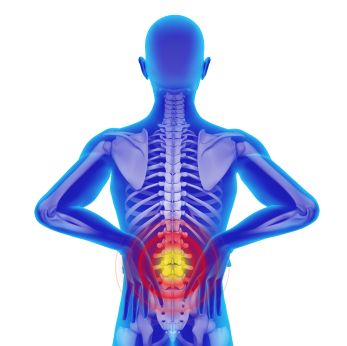 If you have severe or lasting back pain, you should see a medical professional. The doctor will ask questions to try to determine the cause. In some cases, the doctor might use an MRI scan to diagnose back or spine abnormalities. However, some people who do not have back pain might have disk bulges or protrusions. Depending on the severity of your injury, your doctor may prescribe painkillers, physical therapy, exercise, or icing the area. The number of treatments available for back pain has grown over the years, but many involve medical controversy. Surgical treatment is expensive and has mixed results. In America, back pain is the second most common reason people seek medical care, and the cost of medical care is more than $8 billion annually. Therefore, many doctors and back specialists are using noninvasive, traditional approaches including exercise, dealing with stress, and other holistic approaches. However, if your back pain is severe and treatment has not worked, you can enroll in clinical studies. For your own treatment, you should stop any physical activity for a few days, apply ice then heat, and take ibuprofen or acetaminophen to help reduce swelling and avoid aggravating the injury. Although it may sound counterintuitive, prolonged bed rest can actually make your injury worse. After the first few days, slowly start normal activity. For acute back pain, most people improve within four to six weeks. Sciatica is when an injury to or pressure on the sciatic nerve causes pain, numbness, tingling, or weakness in the leg. It is not actually a medical condition but rather a symptom of a medical problem. The sciatic nerve is in the lower spine and travels down the back of the legs. It provides sensation to the legs and controls the back of the knee and lower leg. Sciatica is commonly caused by a slipped disk, pelvic injury or fracture, tumor, or a pain disorder. The pain associated with sciatica varies with each individual from mild pain or discomfort to severe pain that makes the person unable to move. Usually, the pain is on one side of the body. In order to diagnose sciatica, a doctor will ask questions about how the pain started. With sciatica, the pain builds slowly and may get worse after standing or sitting, at night, from sneezing or couching, when walking, or when bending backwards. The doctor will also test your reflexes. Treatment for sciatica is actually treatment of the underlying medical condition. However, you can treat the symptoms. This includes applying heat or ice, taking pain relievers, and physical therapy. Just as with back pain, bed rest is not recommended. Instead, you should reduce physical activity for the first few days then ease back into your normal activities. The spine is composed of 26 vertebrae separated and cushioned by soft disks. A herniated disk (also known as a slipped disk) is where a disk slips out of place or ruptures, which can put pressure on a nerve causing pain, numbness, or weakness. The lower back is the most common location for a herniated disk (second most common are the neck/cervical disks, and thoracic disks are rarely involved). Risk factors for slipped disks include being male, being middle-aged or older, and having congenital conditions affecting the lumbar spinal canal. Symptoms usually occur on one side of the body and include: tingling/burning/aching pain; numbness; sharp pain in leg, hip, calf, sole of foot (indicates of slipped disk in lower back); and pain moving neck, pain in shoulder, arm, fingers (indicates slipped disk in neck). Pain usually builds gradually and can get worse after sitting, at night, when sneezing or coughing, or when bending or walking. These symptoms often improve after several weeks or months. In order to diagnose a herniated disk, you doctor will perform a physical exam to check for numbness, reflexes, and strength. They might also have you walk and bend certain limbs to determine which movements cause increased pain or numbness. Tests such as EMG, MRI, CT, x-ray, and nerve conduction can be used to determine the location of the problem and rule out other causes. Treatment is similar to that for back pain and injury – a few days of rest, medication for pain, and physical therapy. A spinal cord injury involves damage to the spinal cord or nerves and can cause changes in sensation and body functions. The severity of a spinal cord injury depends on the location and severity of the injury. The spinal cord is composed of nerve cells surrounded by the vertebrae. It is responsible for relaying messages between your body and your brain. Spinal cord injuries are categorized as either traumatic or nontraumatic. Some common causes of traumatic spinal cord injury include penetrating injuries (bullet or stab wound), traumatic injury (car accident), landing on head from a fall or when playing sports, falling, diving accident, or extreme twisting of the middle of the body. Alcohol is involved in many spinal cord injuries. Common causes of nontraumatic spinal cord injury include cancer, arthritis, inflammation, infection, or disk degeneration. Risk factors associated with spinal cord injury include being between 16 and 30 years old, being male, engaging in risky behavior, or having a bone or joint disorder. It is important to recognize the symptoms of a spinal cord injury so you do not further aggravate the injury. Common symptoms include: numbness or tingling in an extremity, paralysis, weakness, head position is unusual, loss of bladder or bowel control, loss of consciousness, stiff neck, headache, and shock. If you suspect that someone has suffered a spinal injury, you should not move them unless necessary (ex. for safety reasons). You should immediately call 911 and stay with the person to make sure they do not try to move. It important that you call for help because your neck and back should be splinted to avoid movement and further injury. If the trauma involves a penetrating injury, you should leave the object in place and allow medical personnel to treat you. Doctors will perform tests in order to diagnose a spinal cord injury. These tests include x-rays (show spine problems, tumors, fractures, or degeneration), CT scans (better shows abnormalities), MRI (show herniated disks, masses, or blood clots). Doctors will also perform a physical exam to test sensory function and movement. Lastly, doctors will perform a neurological exam to test the extent of your injury. Although there is no way to reverse the damage caused by a spinal injury, doctors can treat secondary problems such as bowel and bladder issues, blood clots, pressure sores, deconditioning, and infection. Treatment usually includes physical therapy, occupational therapy, and recreational therapy to learn ways to adapt and stay independent. Medications can also be used to treat some of the secondary problems such as muscle contraction and bladder/bowel control. Researchers are working on ways to reverse spinal cord damage, mostly focused on nerve cell regeneration. For serious spinal cord injuries resulting in paralysis, one of the most important aspects of recovery is coping and support. It is important to give yourself time to mourn and learn to adapt to your new life. But, it is important to focus on your options for maintaining an independent life and educate yourself on treatment options. If you suffered a back injury because of a car accident, surgical injury, or other cause, you may be entitled to compensation from the person who caused the injury or accident. Depending on the extent of your injury, you may be entitled to economic (medical bills, lost wages) and noneconomic damages (pain and suffering, loss of consortium, emotional distress). If you suffered a back or neck injury, you should be prepared for what your case may involve. As the plaintiff, it is your burden to establish liability, injury, and damages. Successful litigation requires multiple experts: an expert to testify about the cause of the accident and how the accident happened; doctors and neurologists to testify about the cause and extent of the injury, past and future medical treatment, and past and future pain and suffering; physical therapists and vocational rehabilitation experts to testify about rehabilitation, home assistance, and future treatment. The more serious the injury, the more experts that will be needed to present your side of the case. Back and neck injuries can be very serious injuries that require extensive medical treatment and changes in the way you live your life. Depending on the type of injury, learning new ways to adapt and go about regular activities is one of the most important aspects of recovery. If you were injured because of someone’s actions or negligence, compensation can help you pursue rehabilitative and therapeutic programs that are integral to recovery and independent living. The compensation that you receive for an injury to your back or neck can vary drastically and is largely dependent upon the extent of your injury and the type of care that you receive. Chicago personal injury attorneys, Rosenfeld Injury Lawyers LLC, have help many people with different types of cervical, thoracic and lumbar injuries get the maximum compensation for the their injuries. We offer free legal consultations and never charge a fee without a recovery for you. Come see why many of our clients continue to refer their friends and family.